The collection includes a cross-section of the works by Jonas Mekas which often follow a personal line. We present 13 films altogether, including The Brig about a Marine Corps jail in Japan. Following a day in the life of the inmates, the ultra-realistic film captures the tough treatment and shocking ways of physical and mental humiliation. The film won the Grand Prix at Venice Film Festival in 1964. This Side of Paradise follows the Kennedy family after the death of JFK. Jackie Kennedy decided to distract the children and hired Mekas as a film chronicler. The director spent several summer holidays at the house of Andy Warhol with the family, making a very personal film with a touch of home video and deep friendship which gradually emerged between him and the family. Made in diary style, Williamsburg, Brooklyn shows the neighborhood where Mekas settled after his arrival in the US; most of the scenes were shot between 1948 and 1951 and show the everyday life and little stories from the streets of New York. The film was screened at IFF Rotterdam. Mekas was born in 1922 in a small village in Latvia. During WWII, he and his brother Adolfas were imprisoned in a labor camp. After the war, he studied at the University of Mainz; in 1949, he made it to New York where he has lived ever since. He soon got his first camera and began to record moments from his life. He was a close collaborator with artists such as Andy Warhol, Nico, Allen Ginsberg, Yoko Ono, John Lennon, Salvador Dali and George Maciunas. After 2000, he curated film installations at museums such as Centre Pompidou, Paris, MoMA, New York, and the Venice Biennial. 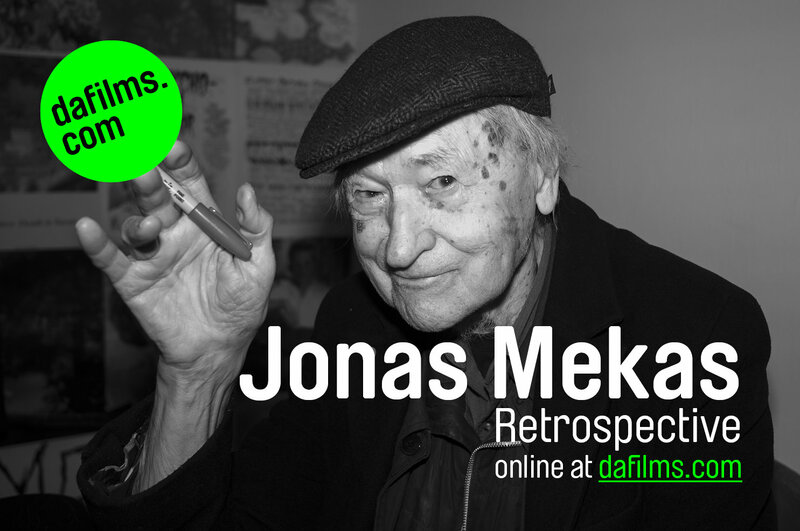 Jonas Mekas, who has made over 70 films besides writing poetry, letters and articles, has supported his fellow filmmakers and artists throughout his life. With his brother, he founded Film Culture magazine and Film-Makers‘ Cinematheque which later became Anthology Film Archives, one of the most important avant-garde cinema repositories. In 2007, he entered the digital world with “The 365 Day Project”, releasing a short film on his website every day. Mekas is a holder of numerous awards for his lifelong work, including the Ordre des Arts et Lettres presented by the Ministry of Culture in France. He is also member of the Academy of Motion Picture Arts and Sciences awarding the Oscars in the US. You can find all the films in the retrospective here. DAFilms.com is one of the oldest online VOD platforms in the world as it was founded already in 2006. Its mission is to promote Czech and international documentary cinema and create a unique publicly accessible video library which now includes over 1700 hand-picked films. The portal is programmed by seven prestigious European documentary festivals.